Delicious, Creamy and Ridiculously Easy No-Churn Strawberry Cheesecake Ice Cream that the whole family will enjoy! So, it’s basically Strawberry Season now, and its being weirdly warm at the moment where I am, so Ice Cream had to happen. However, not just any Ice Cream.. A cheesecake themed Ice Cream. THAT’S RIGHT! CHEESECAKE! I obviously adore Cheesecake, and this is no different. 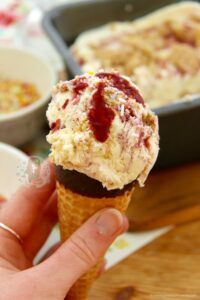 To make it even easier for you guys, I made this into another No-Churn recipe as you all seem to love them so much – and so do I! I decided to make a Strawberry themed cheesecake rather than just a plain cheesecake Ice cream as it makes it taste even better, it makes it look better, and I just utterly adore it. I swirl through some home-made Coulis into my No-Churn Ice Cream because it really is oh so easy to make and tastes amazing. You can of course buy Coulis, but I always have an abundance of strawberries round my house as I always go Strawberry picking when I can, so Strawberry Coulis just happened. 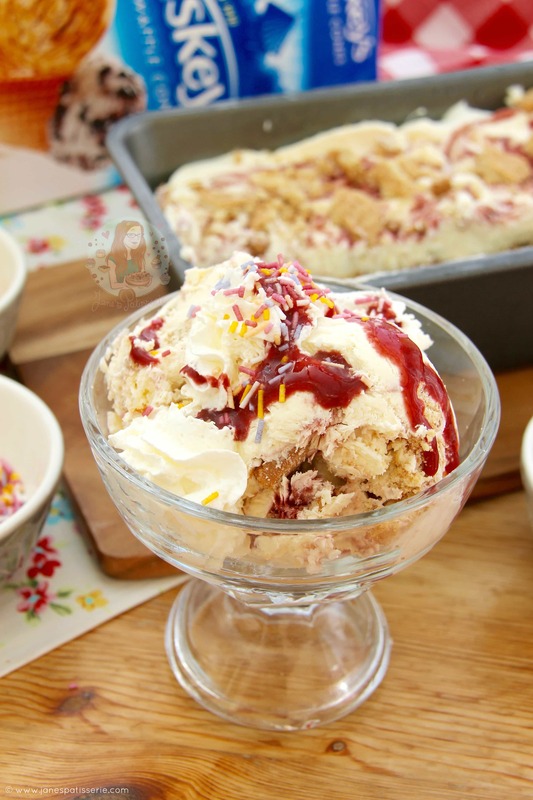 The Ice Cream itself really is so easy to make – literally whipping the ingredients together till thick, and swirling through the coulis with some crushed biscuits. Cheesecake Ice Cream is a delicious invention, that no – I didn’t come up with it, but I tried to put my own spin on it. I tend to gobble up some of the mixture before it even gets to the freezer, so I don’t blame you if this happens yourself. I don’t judge. 1) Chop the the strawberries into quarters and remove the tops, add the strawberries in to a pan with the sugar and heat on a medium heat – mash the fruit with a fork and heat and stir until the sugar has dissolved and the fruit has become saucy. Pass the mixture through a sieve into a bowl and bin the mushy bits that are left – refrigerate until needed. 2) In a Stand Mixer with the whisk attachment (or a large bowl with a hand-held whisk) Whisk together the tin double cream, condensed milk, cream cheese and vanilla on a medium speed until smooth – can take a couple of minutes. 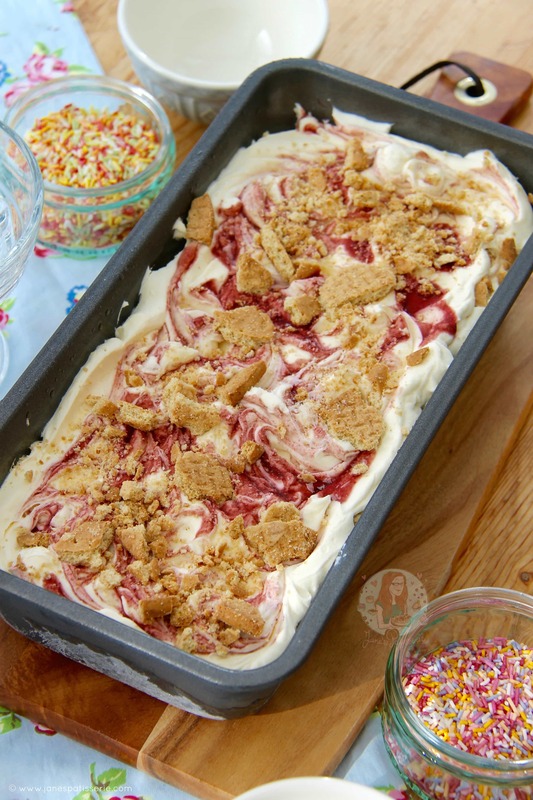 3) Spoon 1/3 of the cheesecake ice cream mixture into the bottom of a 2lb loaf tin or similar – spoon over a 2tbsps of coulis and swirl with the end of a cake skewer. 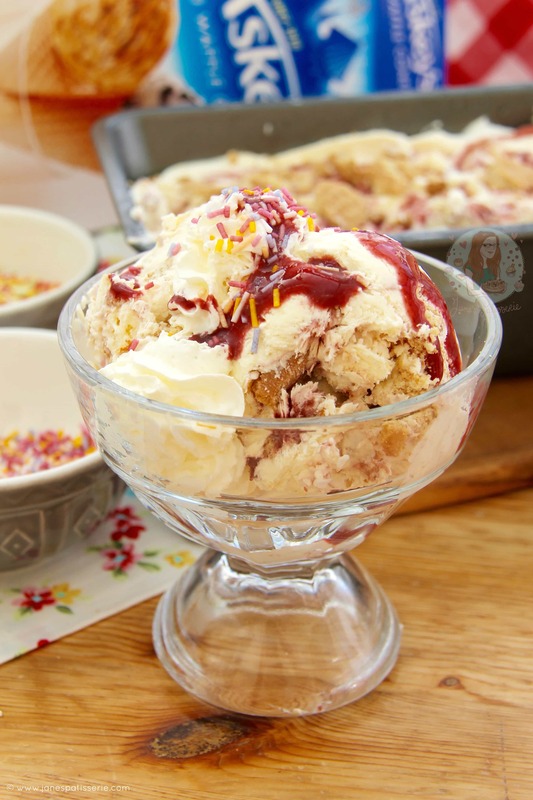 Sprinkle over 1/3 of the crushed digestives – repeat the ice cream, coulis and biscuit steps again twice more! Cover with a lid or some cling film and freeze for at least 4-5 hours, or over night! 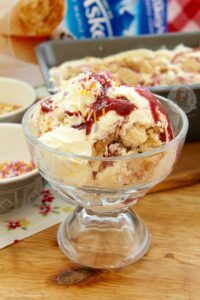 4) To serve – remove from the freezer AT LEAST 30 Minutes before you want to serve it – as its homemade it will be a lot harder than most shop bought ice-creams – you haven’t done anything wrong, this is because it hasn’t got a tonne of added preservatives in it! Serve how you like and ENJOY!! If the Cream Cheese has lots of liquid in the packet, try and get rid of it first as it’s a bit manky, and isn’t very nice – but don’t worry if you can’t see it – it’ll be fine! You could swap up the flavours of the sauce you use if you like and make raspberry coulis, blueberry, blackberry etc – any would work well with the cheesecake mixture. You could even make the coulis slightly more tart by using 200g Strawberries and 100g of Raspberries with the same amount of sugar. Same applies with the biscuits, any biscuit will do really, but I love digestives! 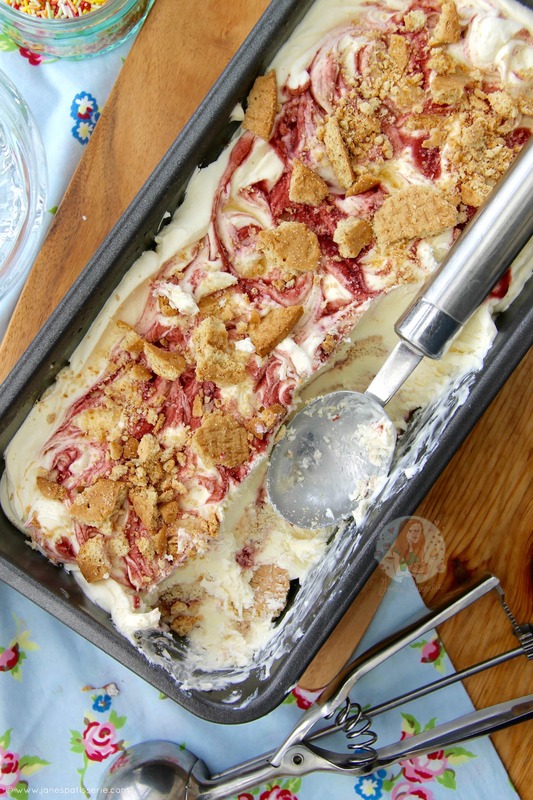 Find my other Ice Cream & Cheesecake Recipes on my Recipes Page! Newer Previous post: Chocolate Oat Cookies! This is delicious! I used it with a biscuit base in a loose bottomed tin to make a frozen strawberry cheesecake ice cream pie. This looks delicious…I’d like to try this and freeze in individual glasses! To make it even quicker, could I use shop bought coulis? If so, how much do you think I should use? Yeah of course you can, I just don’t like the added extras they put in shop bought stuff and its entirely up to you how much you use. Ohh thank you Jessica! ❤️ It’s so much easier this way and I love it!